But Kevin Hart, like Ernest Hemingway, J.K. Rowling, and Chocolate Droppa before him, was able to defy the odds and turn it around. In his literary debut, he takes the listener on a journey through what his life was, what it is today, and how he’s overcome each challenge to become the man he is today. Why did you choose this audio book? Story time: For the most part I listened to this at the gym, so it’s cardio, this audiobook and these gainz. I’m super excited. But then, Kevin Hart starts talking about his dad… talk about out of control! Just as I was about to feel sorry for anyone listening who like me, wasn’t ready (I feel for you) but I was also laughing and had to get over it. I mean, it’s hilarious. 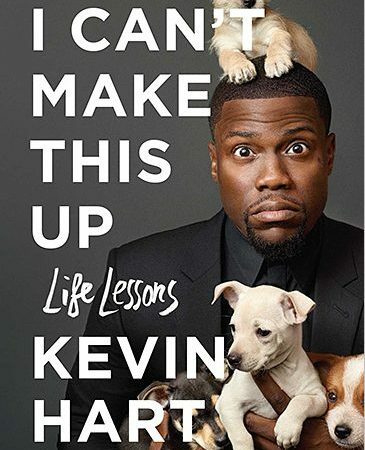 I chose this book because I was interested in seeing the whole picture of who Kevin Hart is from humble beginnings to who we know now as the superstar. I was genuinely curious how he went from Soul Plane (which is simultaneously a complete dud & a cult classic) to one of this generations kings of comedy. I usually think of memoirs as more an appropriate reflexion at the end of a career, but it’s becoming more and more common for people who’ve been through some things to have more than enough reason to do so now. Kevin Hart has been around for quite some time and he’s been through more than his fair share of drama, which made for a great story from start to finish. What main themes does the author explore? Well, I feel like Siri, every time something bad or unsavory happens, I’ll get there from another way. Ultimately, Kevin gives us many reasons to embrace who we are, our story, through his decision to attack comedy from real life experiences not just concocted jokes that made people laugh. The nature of these real life experiences are so wild that you literally can’t make this stuff up. There were a lot of aha moments and of course great lessons, but I think the most impactful was his eventual approach to auditioning. In our daily lives we’re selling ourselves. Depending upon where you are professionally, you could be gearing yourself for a change soon where it’s for a promotion or a move. Your current role impacts the now and the next step too. At a certain point Kevin was not so much worried about the current role he was up for but the next role. If he wasn’t meant for THAT part, he made such an impression that he would be considered for the right one. How has the book changed or broadened your perspective? As an Old Millennial® I tend to find it hard to relate to all of my generation. I mean, I’m pushing 30 and not in total crisis so that’s great, but my perspective is a mixture of responsible adult and individual with 0% of the answers. I guess this book has informed my decision to not sweat the small or the big stuff. If I’m in the middle, I still have some pushing forward to do, and that’s going to be okay. Not only what’s meant to be will be, but worrying about things is not going to make the process any easier. Learning to be more patient while carrying on to the next phase of life, that’s my biggest takeaway. Lastly, this memoir has reinforced my ability to look at my life retrospectively and accept certain missteps and detours as meaningful lessons that have molded me into a better person. In the same way that Kevin sees his parents’ failed relationship, some failures are actually for the best. Sometimes sustaining some relationships stifle the growth necessary to reach the ground you’ve reached in the present. Check out last year’s Summer Audible Book Club!